Dates announced for AMA Vintage Motorcycle Days. If you love old motorcycles, and the people and activities that make them great, circle July 8-10, 2016, on your calendar. That's the date for next year's premier celebration of vintage motorcycling: AMA Vintage Motorcycle Days at Mid-Ohio Sports Car Course in Lexington, Ohio. "A new generation is realizing how much fun you can have on old motorcycles, whether they are barn fresh, pristine show pieces or what we call 'swap meet specials,'" said AMA Chief Operations Officer Jeff Massey. "AMA Vintage Motorcycle Days, from the vintage racing to the huge swap meet, is witnessing this resurgence first hand, and let me be the first to invite all vintage motorcycling enthusiasts to this wonderful event." A fundraiser for the AMA Motorcycle Hall of Fame, AMA Vintage Motorcycle Days features classic motorcycles of all makes and styles, and honors the riders who made them famous. Activities include the AMA Vintage Grand Championship, which features road racing, motocross, hare scrambles, trials and dirt-track racing. The event also includes North America's largest motorcycle swap meet with parts, bikes and memorabilia from all eras. A premier bike show will feature examples of some of history's most beloved motorcycles. Stunt shows and demo rides of current production bikes keep attendees entertained, while seminars on numerous topics by noted motorcycling experts keep them informed. AMA members who buy tickets directly from the AMA before June 6 receive an exclusive price discount. AMA members can call (800) 262-5646 to purchase a weekend pass for $45, a $5 savings off the regular advance rate, and a one-day pass for $25 for Friday or Saturday and $20 for Sunday, a $5 savings off the regular advance rate. There is no service charge for AMA members when purchasing through the AMA. AMA Vintage Motorcycle Days is a family-friendly event. Children 12 and under get in free with paying, supervising adults. 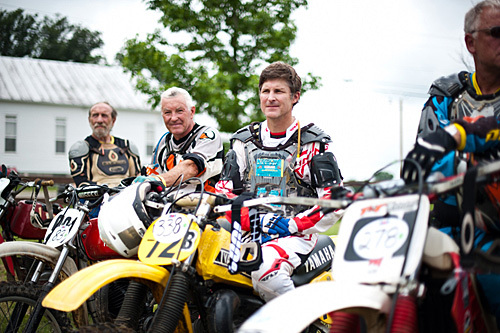 All proceeds from AMA Vintage Motorcycle Days benefit the AMA Motorcycle Hall of Fame. The mission of the Hall of Fame, located on the AMA campus in Pickerington, Ohio, is to tell the stories and preserve the history of motorcycling's legends and heroes. For more information, call (614) 856-2222, or visit the Hall of Fame's website at www.motorcyclemuseum.org.